Bolshoi Theatre is one of the biggest attractions of the Russian capital Moscow. It is located in the heart of the city. Bolshoi theater’s building represents classical Russian architecture. In fact, the theater is the second largest opera stage in Europe. only La Scala is larger than Bolshoi. Over the years the building served as home of the legendary Bolshoi Ballet and Opera - considered one of the best in the world. The neoclassical building impresses one with its stature and size, it is considered an architectural masterpiece of Russia. Bolshoi Theater for decades has been the scene of wonderful ballet and opera performances. Today the building is closed to visitors. By the end of 2011, Bolshoi Theatre is expected to open its doors to eager admirers of beauty and art. The theater is closed since 2005. Into the restoration of the building were invested around 730 million dollars. After its end the original acoustics of the hall will be restored, which has lost its luster due to faulty repairs over the years. By the end of 2011, the magnificence of the hall is expected to be renovated to reveal its charms. Fine statues, soft armchairs and sumptuously decorated rooms are just some of the interior marvel of the Bolshoi. The renovation’s idea is to try to recreate the spirit and atmosphere of the 19th century. There is also the matter of replacing the golden-red curtain of the Bolshoi, which depicted a hammer and sickle. On stage at the Bolshoi more than half of the performances are the work of Russian cultural figures. 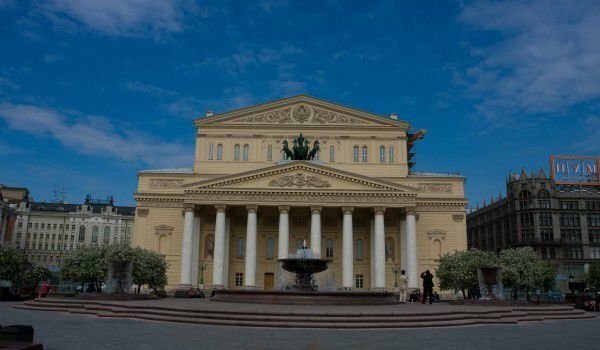 Bolshoi Theatre has become an institution and one of the main movers of Russian culture and art. Although the theater is home to both the ballet and operetta art, many people associate the Bolshoi Theatre with unique performances of the Bolshoi Ballet. The world famous company started in the 18th century as a dance school in a Moscow orphanage, developing its own unique style. For decades, the composition of the Bolshoi Ballet has performed many beautiful performances on stage of the Moscow theater and worldwide. It was in the Bolshoi Theater that for the first time back in 1887 Tchaikovsky presents his "Swan Lake". The opera in Russia also begun its tradition in the Bolshoi Theatre. The stage of the theater has educated the tastes of Moscow’s locals and guests of the city, since the late 19th century. Rossini, Verdi and Puccini are just some of the artists who tell their art through their inspiration in the spotlight of Russian theater. The facade of the building is spectacular with astonishing precision elements and carved statues. The first name of the cultural center was "Petrovski", named after the street on which it is erected. Even before the official opening of the building, however, the theater had burned. Subsequently, a British man - Michael Maddocs is charged with the important task of rebuilding the theater. A second fire destroyed the building again in 1805. Seven years later, a third fire followed. The reason - wood and flammable material from which the theater is built. The contemporary appearance of the building adheres to the form in which it was built in 1821. The design of the Bolshoi Theatre is by Joseph Beauvais. During the Second World War, the building suffered damage, but still resisted the bombing. Today, the Bolshoi Theatre is one of Moscow's post cards and one of the emblems of the Russian capital.